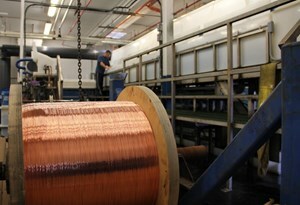 US ITER toroidal field coil conductor production requires four miles worth of niobium-tin superconducting wire. Photo: Luvata Waterbury, Inc.
ITER will use 100,000 kilometres of low-temperature, helium-cooled superconducting wire to generate the immense toroidal magnetic fields needed to confine the 150-million-degree Celsius plasma inside a tokamak machine. "By next September, US ITER will have its share of that wire ready," says Kevin Chan, a project engineer for the US ITER magnet systems. The United States is responsible for 8 percent of the toroidal field coil conductor that the huge experimental fusion reactor requires; the rest of the conductor will be supplied by other ITER Members. Eighteen toroidal field magnets will encircle the inside walls of the ten-story-tall tokamak. The US contribution translates into nine lengths of conductor packed with compacted niobium-tin wire, with each conductor length just under half a mile long. The internal-tin process superconducting wire is being made to ITER Organization specifications at Luvata Waterbury, Inc., in Waterbury, Connecticut, and Oxford Superconducting Technology, in Carteret, New Jersey. "Before ITER, worldwide production was 20 metric tons of this wire a year," Chan said. "Now, Luvata and Oxford Superconducting Technology each are producing 5 metric tons a month." Between the two companies, nearly 200 jobs were added when the manufacturers were awarded US ITER contracts. It is Chan's job to ensure that the toroidal field conductor is assembled with high quality, on time, and under cost. The engineer worked in the metals industry for 14 years before joining US ITER 2 years ago. "When you produce toroidal field strands of wire, there is performance data and you look at what that tells you. The production data indicates trends," Chan explains. "The supplier is continually testing and sending us the data, and my responsibility is to look at the data. I actually watch the results of those tests. I can see, oh, something is changing. Something is not behaving as it should. Why is this? And one looks and tries to understand. That is how we work to optimize the product." 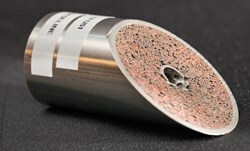 The ITER Organization sets out the testing requirements for every component made for ITER. "What I do," Chan explained, "is verify that each test has been passed. Each of the 1,422 pieces of this strand that make up the nine lengths of conductor has to be tested and must pass." Chan said that when the finished conductor is delivered, the US ITER's commitment to that part of the project is complete. "It is high-value material, so the delivery is a big deal," he said. "Each conductor length is worth USD 5 million, and there are nine of them." But making more than four miles' worth of wire is just the beginning of producing the finished conductor. The lengths of wire must be wound on hundreds of small spools and shipped to a cabling facility, New England Wire Technologies in New Hampshire, and later to an external casing, or jacketing, facility at High Performance Magnetics in Tallahassee, Florida. The assembly of the finished conductor is expected to take until 2016. Assembling the cable in New Hampshire is a five-stage process. Initially, two superconducting strands and one copper strand are twisted together; next, three sets of strands are bound into a bundle; then, five of these bundles are twisted together. The resulting quintuple cord is arranged into a special configuration and becomes the subcable. Finally, to make the finished superconducting cable, six subcables are bound together around a central cooling spiral, which will permit the flow of liquid helium for cooling the wire when the magnet is energized. The cable is then wound onto spools and sent to Tallahassee for an integration process where the cable lengths will be straightened and inserted into stainless steel tube sleeves, called jackets. These conductors are then wound onto four-metre diameter spools and shipped to France. At the ITER site, the coil winders will reconfigure the conductors for installation. The conductors will be unwound and shaped into multiple layers called "double pancakes" to support the toroidal field magnets. The 760 metre-long cable will yield "regular double pancakes," and the 415 metre-long pieces will make "side double pancakes." Each of the 18 toroidal field superconducting coils requires five regular double pancakes and two side double pancakes. In total, the toroidal field coils will weigh more than 6,500 tonnes, and will have a total magnetic energy of 41 gigajoules and a maximum magnetic field of 11.8 tesla.